For quite a few Christmases, I have worked hard at perfecting a certain little trick with my mind—the art of deliberately forgetting. Now I can already forget many things without much effort. For instance, this Christmas, when the time came to put our grandchildren’s presents under the tree, I discovered I had forgotten where I had hidden several of them. Then after finally locating them, I found I had no idea what was in those carefully wrapped parcels! But I am like an olive tree flourishing in the house of God; I trust in God’s unfailing love for ever and ever. Cast your cares on the Lord and he will sustain you; he will never let the righteous fall. In God whose word I praise, in God I trust; I will not be afraid. What can mortal man do to me? So why would I want to fine hone this skill of forgetting things any further? Well, the reason I do this each Christmas is to help out my husband, who is often stumped for gift ideas for me. So if I see something I would like for myself for Christmas, I buy it—providing it’s not too expensive, that is! Usually it is a book—perhaps a new one by a favourite author or one a friend whose opinion I trust has recommended. But once the checkout person puts that book in its carry bag, my little forgetting trick comes into play. There is a way, I have discovered, of not letting my mind dwell on that purchase anymore, of choosing to delete it from my memory—perhaps not completely, but close enough to it. If I tried, I’m sure I could recall the author of the book, although the title might escape me. But … why would I want to? After all, why spoil the lovely surprise on Christmas morning when I am presented with my gift and discover it is just the sort of excellent book I love to read?! So as you step into 2019, what is God challenging you to remember that will strengthen you and give you much needed wisdom and peace? But also … what things might be better to forget? Sometimes it seems to me God uses the most mundane experiences of life and the things right in front of our nose to speak to us. Our part is to have eyes to see and ears to hear—and a heart to follow and live in the light of what God shows us. I noticed this on two recent occasions that seemed quite disconnected at first. One day while dusting our house, I noticed some large, plastic folders on a bookshelf and looked more closely to see what they were. I discovered some were training manuals from courses I had attended in the past, while others contained leadership material for courses I myself had helped run. They would all be outdated now for sure. Out they went—but not without some pangs of regret. It had all been so valuable at the time. And I know such input impacted people’s lives, including mine. Then I moved on to examine some thicker plastic folders. Inside them, I found neatly packaged cassette tapes from various conferences I had attended in the early nineties. What wonderful conferences they were, where the Holy Spirit moved amongst us in an amazing way and where we learnt so much more about how to pray and listen to God’s voice! I found smaller packs of cassettes too from prayer courses I had attended and other recordings of well-known Christian leaders at the time. This material had been transformational for me and many others. Yet who would listen to cassettes now? I could have them made into a more modern format—but would it be worth it? I decided in the end it would not be. Apart from just a few I did not have the heart to throw out, into the bin they went. At that point, I decided there was no point in sitting around thinking melancholy thoughts. There were more jobs to be done, including hanging out that washing! As I did, I noticed our old iris plants were in bloom, their white floppy heads bobbing in the breeze, and there were new white blossoms on the azaleas and may bush. A few jonquils and baby daffodils had appeared, while various ground cover plants were also flourishing. In the midst of it all, the grevillea stood proud, with its lovely apricot and orange blooms, while my Christmas bush seemed to have shot up a few more centimetres overnight. Spring had certainly arrived. A new season was upon us. 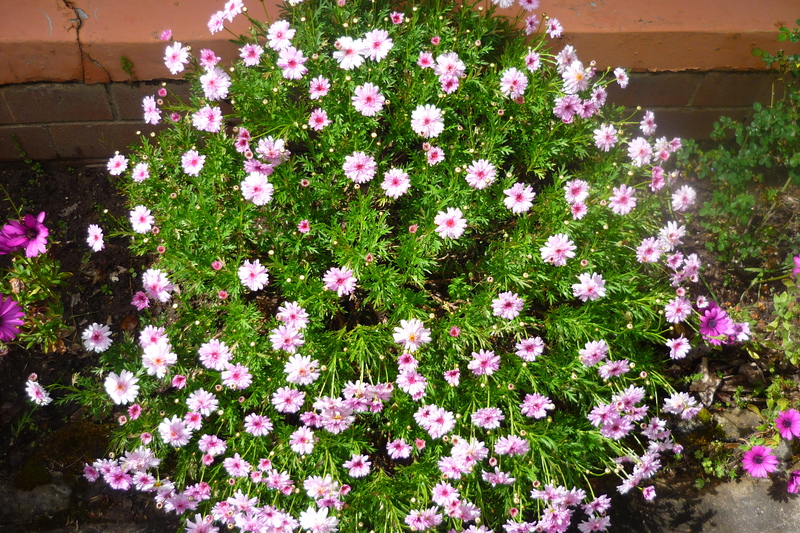 I went on to the front garden—and there before me was a small shrub I was sure had died over winter, now covered in pretty pink, daisy-like flowers. May you too listen and hear and perceive the things God has for you in this season of your life.